Yesterday's session was a hot one for the stock of Global Hunter Corp. The shares (CVE:BOB), (PINK:GBLHF) went steadily up, supported by the large volume too. Something must have provoked such a performance, but there was no official news issued by the corporation. Maybe, speculative reasons made the stock come closer to its 52-week high of $0.175 that was set back in November. On Tuesday, BOB climbed by 12.5% and ended the session at $0.135. This represents 77% of the yearly-high. Currently, the price is at its 2011 peak. The same goes for yesterday's trading volume. The 3.28M shares that were traded exceed eight times the average from the last 30 days. This turnover marks a six-month high, and is a record for 2011 too. In the absence of any fresh information issued by Global Hunter, we might only guess what has caused the surge of the stock. It is not astonishing we come to the assumption that investors probably had their speculative motives to appreciate the shares' rise. The latest announcements released by the company were from the beginning of this month. Global secured $3.3M for its exploration program on the Corona de Cobre project in Chile by closing a non-brokered private placement. Through another release dated May 4th, the public was informed that Global expects to commence drilling on its Las Posadas project later in May. Perhaps, the drilling program has already begun, which might be another explanation for the the climb of the shares. In the same disclosure, the company announced its intentions to perform a round of infill drilling in an attempt to upgrade the existing resource. Infill drilling, as known from theory, means adding new wells in an existing field within the original well patterns, in order to accelerate recovery and production or to test different recovery methods. 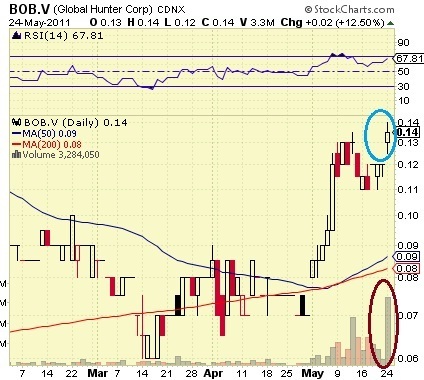 In spite of the positive company developments and the upward move of the shares, we must pay some attention to several not so favorable factors regarding Global Hunter. The corporation has not advanced to the production phase and is still in the development stage. Accordingly, it earns no revenues. The net loss for the quarter ended Nov. 30, 2010 was 0.855M. Besides, the shareholder dilution is huge too. Global raises additional funds mainly through the issuance of new shares, which increases the dilution to stockholders. The average number of outstanding shares has jumped from 74.5M in 2009 to 142.7M in 2010, or by approximately 92%.